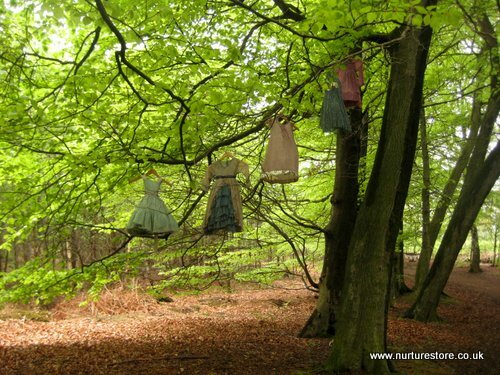 The girls and I were invited to join Wild Rumpus for a trip to The Spellbound Forest at the weekend. 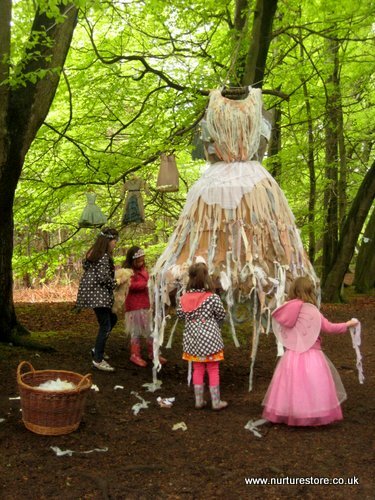 Created by the team behind the Just So Festival, The Spellbound Forest weaved it’s magic through Delamere Forest in Cheshire, bringing to life four English fairy tales with a mixture of story telling, theatre, music, dance, woodland crafts and toy making. The event was like a forest school on a grand scale, full of inspiration and ideas to bring back and adapt to keep the outdoor story telling alive at home. So your outdoor setting might not be quite as magnificent as a huge forest, but there mere fact that the children are stepping outside brings new elements to their play and learning: fresh air, closeness to nature and the excitement of being some where different. Whatever play stations you create inside can work outside too, perhaps with a little adaptation. 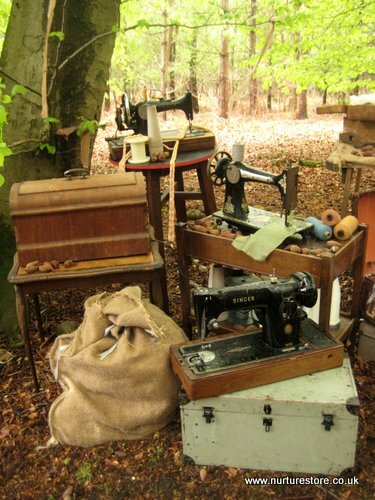 The Spellbound Forest had a dressmakers, a dressing up ball and a feast outdoors, full of interesting props for the children to explore. The kids were excited to find unexpected and quirky objects ready for them to play with. What elements of your indoor role play could you transfer outdoors? What aspects from your favourite stories could you recreate outdoors so the children can become the characters from the tales themselves and let their imaginations soar? Give them pebbles and breadcrumbs to be Hansel and Gretel. A red cloak and a basket of provisions to be Red Riding Hood. Build a boat from crates or even a washing basket for The Owl and the Pussycat. 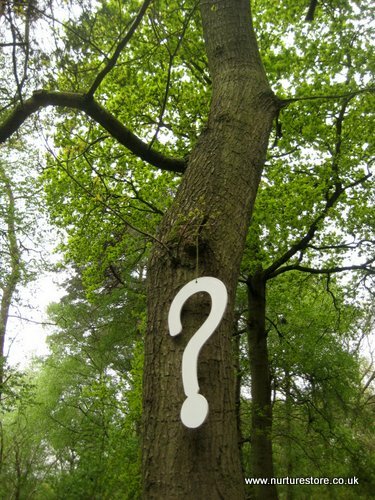 What could you include in your garden or playground or woodland area to give the children a surprise? An unexpected spectacle to get them wondering and talking? Even a tiny outdoor space can be made magical with a few added touches to re-invent the outdoor space each week. For children a little reluctant to venture outdoors it gives them a incentive to head out and explore, to find this week’s hidden treasures. 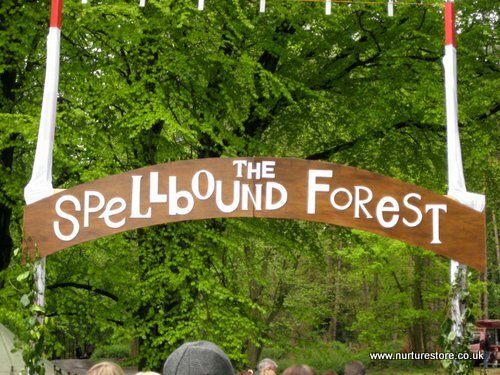 The Spellbound Forest team are masters at using the natural spaces and props the woodland provides. 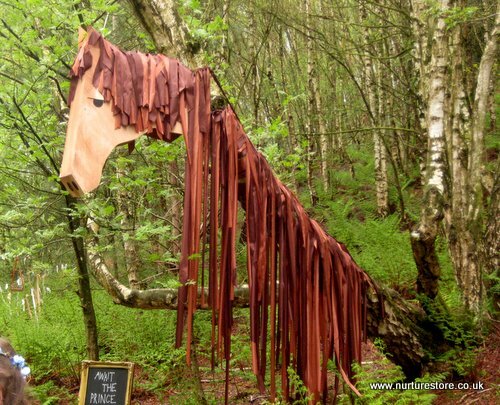 Just the right clearing next to a path was transformed into a dining room, and the overhanging trunk of a tree became a horse. Audit your outdoor space, look at your garden with fresh eyes and see what your setting offers. And if you can’t see the possibilities – ask the children. 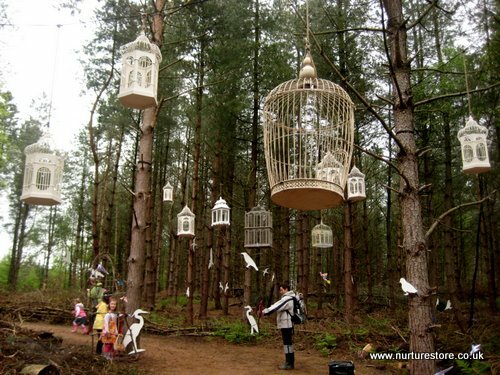 Create a breathtaking spectacle in your forest school area by making the most of the physical space. Play with size and create surprises. In a tiny space one huge prop can make a big impression, or go to the other end of the scale an create a tiny fairy garden. 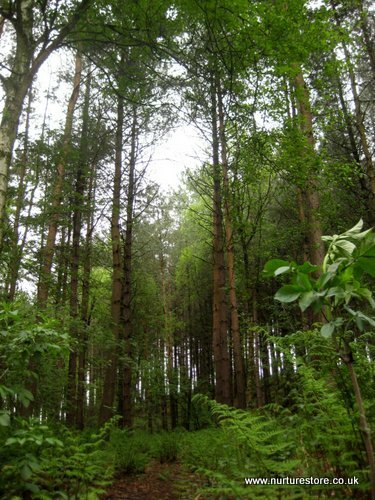 Make your forest school area a print rich environment. Include quotes and snippets from the stories you are reading. Take literacy outdoors and provide blackboards, chalks, clipboards and pencils so the children can make their mark too. The Spellbound Forest gave the children so many hands on opportunities to join in the story telling – helping to make Tattercoat’s ball gown, using willow and twig wands to cut through overgrown paths, making hobby horses from sticks from the forest floor so they could ride off to the Grand Ball. It’s good to listen to stories but even better to be part of the tale itself. What could you do in your outdoor space to fire the children’s imaginations? What quirky touches could you add? Borrow some inspiration from The Spellbound Forest and bring forest school elements to your setting. 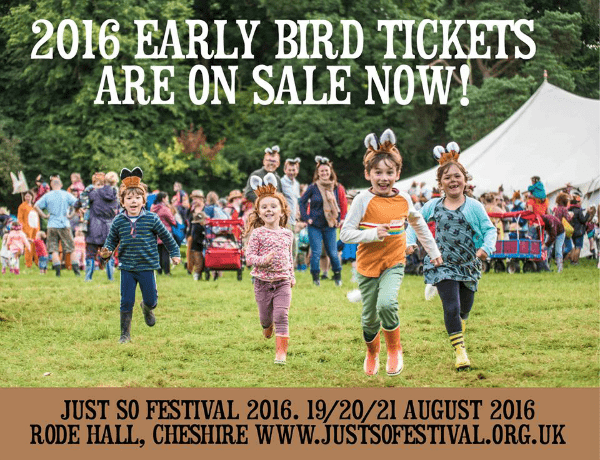 The Just So Festival 2016 will run from 19 – 21 August 2016. Tickets are on sale now with Early Bird prices of £110 per adult and £45 per child for weekend tickets. (They’ll be £125 per adult and £50 per child after early birds have sold out). Day Tickets are also available, and under 3s are free. Disclosure: We received free press tickets to attend the Just So Festival. Previous article: Talking to children about cancerNext article: The best Kids Activities pages on Facebook: in one easy subscribe list! Wow! What a wonderful event! This would be fun to try at home! We enjoyed ourselves there, though it was just a little bit too girly at times for my boys, and there were one or two organisational issues which I think need a bit more work. Brilliant concept though, and really looking forward to the Just So Festival. We’re camping there this year! Oh my this looks amazing! I wish they had something like that by us we would definitely go. What lucky kiddos you have. 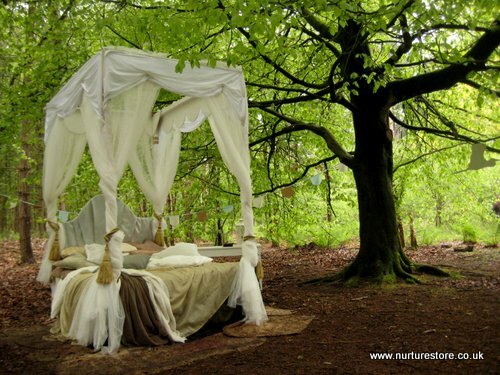 Oh my goodness, I could live there or I would settle for a nap in that canopy bed! Thank you for sharing such an inspiring place! 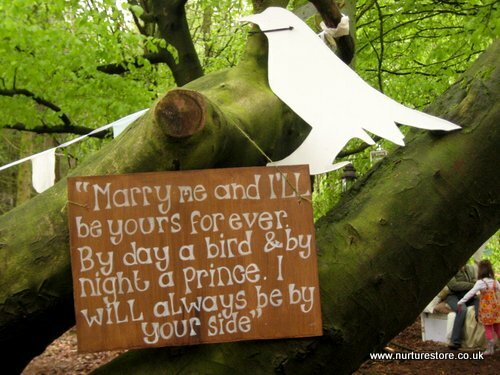 Sounds like an amazing festival, I love fairy tales, as well as forests and outdoor play, what an amazing combination. Love the pictures! O my gosh, these settings are so inspiring! Thick forest, stories, props – what else does a child need! Thank you for sharing all the pictures and ideas!